My harvests took a decidedly wintry turn this week. Last Friday was warmish and sunny but the forecast for the next week was for the "storm gate" to open, rain was and is in the forecast for days to come. I took the opportunity to get out to the garden to do some harvesting before it got to be too soggy. There's a couple of new things in the harvest baskets this week. The first good sized parsnips were ready to pull. Those should be a fairly regular item in the basket in the coming weeks. The fennel is still coming from the plants that I sowed back in the spring of 2018. The bulbs are small now but still good eating. And I pulled a couple more celeriac which are holding very well in the garden in the short and cooler days of winter. 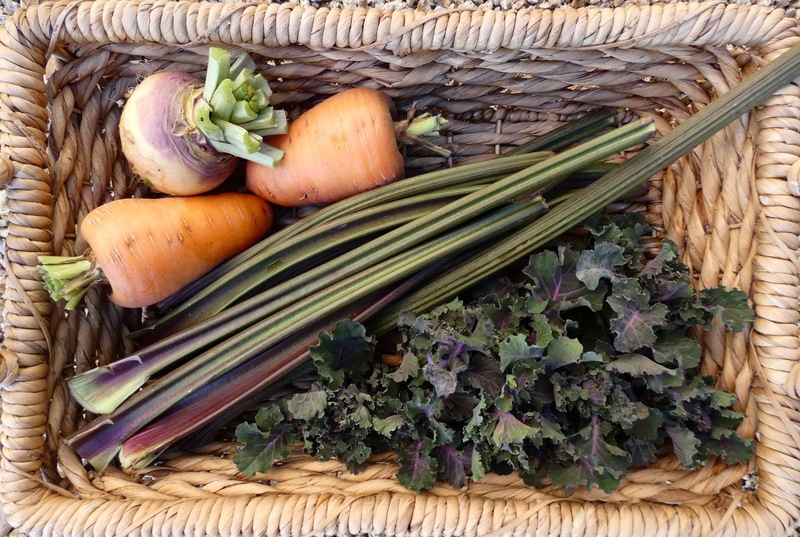 The new item in this basket is the first Improved Helenor Rutabaga. I'm still harvesting carrots and celery as I need them. The carrots are getting fatter and fatter but are sweeter than ever. Those 2 carrots weighed in at 1.25 pounds without their tops. The celery is growing more slowly but is now more crisp and juicy than in warmer weather. The one stalk of Autumn Star kalettes that's in the garden produced enough mature sprouts for a couple of servings. I used that one lone rutabaga plus one of the celeriac and some lingering potatoes to make a Smashed Root Gratin that Dave declared to be delicious and which he said was worthy of writing up so I could make it again. To accompany the gratin I sautéed the kalettes with some shredded duck confit, the recipe for which you can find HERE. If you have a harvest you want to show off then enter a link to your post below and please leave a comment too. And be sure to visit the other bloggers who link up here. Our harvests will be quite monotonous over winter but nontheless welcome. Maybe we should try growing celeriac again. What are the secrets to success. The main secret is patience, lots of it. It's finicky to start from seed and slow to grow, but once established in the garden it's easy because it just needs a steady supply of water. But it still takes plenty of patience while it grows to harvestable size. I sowed my seeds in pots on March 30, set the seedlings out on June 17, and harvested the first roots on November 22. Isn't the celery at its best in the winter? There is nothing like it at the grocery store--so crisp and succulent. I agree that carrots, like other root veggies are best stored in the ground. Isn't the rain wonderful? The rain is fantastic. And oh yes, winter celery is the best and the root vegetables are at their best too. Lovely harvests during a wintry week. 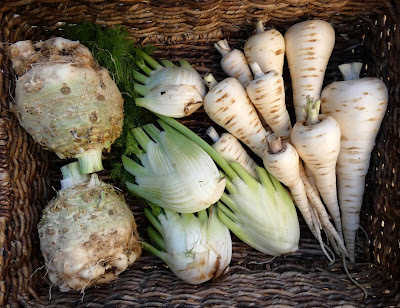 I'm keep going back and forth as to whether or not I'll be including parsnips in the garden this year - for the last two years I've planned to include them but the seeds never made it outside. They are well worth the effort. It's such an under-appreciated vegetable. It's good you are getting some needed rain. Those two carrots are deceptively big! If only I could grow them like that. We got more than an inch of rain yesterday. It's most welcome. Ooh, yummy harvests Michelle. Incedibly neat presentation too! I've been visiting family for a few days so nothing to report from me this week.